MISS NATASHA ENQUIST: ELECTRO-ACCORDION CHANTEUSE: New "Squeeze Me - Accordion Chic Apparel" items available! New "Squeeze Me - Accordion Chic Apparel" items available! 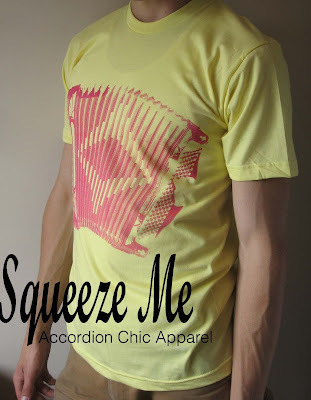 New "Squeeze Me - Accordion Chic Apparel" items available on the online Etsy shop! As a designer, I wanted all accordionists and accordion lovers alike to have a stylish, eye catching - but comfortable line of apparel so that everyone can show off their love and devotion to this internationally loved instrument! An Accordionist myself, this new line of clothing has evolved naturally for her, and has been a joy to create and have so many fans. I have been in the fashion design industry for the past 9 years, and started off with my fashion line "Aspekt Clothing and Design." My fashion business has been in over 20 different retailers across Canada, and I have taken part in many retail, trade and fashion shows, television appearances, youth empowerment seminars, and donates every year to the Visions Fundraiser for the Victoria Hospitals Foundation. I now have directed my designing abilities to costuming, and "Squeeze Me - Accordion Chic Apparel". This line is for those who desire to be more Accordion chic, with a selection of apparel with fun accordion silk-screened images. With seven different images to choose from, you are sure to show some accordion love every day of the week! Private orders more than welcome! Place your order today!